The smart money has Kevin Durant signing elsewhere this summer, which makes it more imperative for Golden State to keep its dynamic backcourt intact. The Warriors would probably have to max out Thompson at $190MM over five years and ownership appears willing to do so. If not, rivals with ample cap space would certainly give him a four-year, $140MM deal, the max they could offer. In any case, Thompson won’t have to take a discount the way the market figures to play out. Even in a somewhat down year by his standards, he still had the sixth-most 3-point makes in the NBA. The cap-strapped Pistons figured they couldn’t re-sign Bullock, so they traded him to the Lakers for a couple of assets. He was Detroit’s most reliable wing player but things didn’t go well for him in L.A. He never got into a shooting rhythm with the Lakers, as the career 39.2% long-range gunner made just 34.3% of his 3-point shots. Bullock’s price tag might have gone down somewhat, though he should still field some multi-year offers. He might even return to Detroit, where he played four seasons, if the Pistons can fit him into their budget. McGruder finished his season in the Clippers organization, though he’s ineligible for the playoffs. Miami put him on waivers to get under the luxury tax and the Clippers claimed him. The Clippers gained control of his Early Bird rights and can make him a restricted free agent by extending a $3MM qualifying offer. It seems that McGruder might benefit from Miami’s surprising move, as he could claim a rotation role with his new club depending upon how well they do in free agency. If they choose not to give him a QO, he should be able to secure a contract on the open market befitting a second-unit player. How crazy is this? Crawford entered the league in 2000, the same year Zion Williamson was born. They could be teammates next season. That’s if Crawford decides re-sign with Phoenix. He wants to play at least another year and why not? This week, Crawford became the oldest player in NBA history to record a 50-point game. Crawford appeared in 64 games with Phoenix after playing a minimum of 79 the previous three years. He’ll be providing offense off the bench somewhere next season, a tribute to his preparation, perseverance and durability. Cauley-Stein said prior to the season he was “ready to get paid” after his walk year. He started all but one game this season for Sacramento but didn’t really enhance his value. He’s not a shot-blocker. He doesn’t rebound particularly well for his size. He can’t shoot free throws, nor does he pose much of an offensive threat. The Kings can make him a restricted free agent by extending a $6.25MM qualifying offer but even that’s not a given. Cauley-Stein will certainly get a raise compared to his rookie deal but it probably won’t be what he expected. The Lakers failed to put the right pieces around LeBron James during year one of The King’s reign in Los Angeles. Despite the disappointment, owner Jeanie Buss still has complete faith in both team president Magic Johnson and GM Rob Pelinka, a source close to the situation tells Bill Oram of The Athletic. The two executives have had their share of missteps during their time with the team. For instance, as Oram details, when the Lakers signed James, neither Pelinka or Johnson put in the kind of research that rival organizations typically do when landing a top star. When the Celtics traded for Kyrie Irving, the team made calls to former coaches and those around him in pursuit of intel on the point guard. Had the Lakers put in that type of work, they may have known, for example, that LBJ playing off the ball wasn’t going to be something they should plan around even if the four-time MVP had signed off on the strategy during July 2018 discussions. The team will chase stars like Kawhi Leonard, Kevin Durant, and Klay Thompson this summer, though the Lakers don’t appear to be atop any of those players’ lists, per Oram’s piece, which Shams Charania, Joe Vardon, Sam Amick, and Frank Isola also contributed to. The thinking process may be shifting behind the scenes in Los Angeles as a result of the lack of interest in the Lakers. “You don’t need names, you need games,” a source close to James tells Oram. That differs from Johnson declaring last year that this summer would bring another superstar. Regardless of which players the Lakers roster, Luke Walton is unlikely to coach them. Johnson clashed with Walton throughout the season with tension rising during an early-season meeting. Oram writes that Johnson delivered Walton with a “closed-door tongue lashing.” From that point on, Walton had reason to be concerned about his job security. According to Isola, the Lakers reached out to former Bucks coach Jason Kidd during the season. However, a high-ranking official within the organization refutes the claim. Kyle Kuzma was told prior to his trip to Charlotte for All-Star weekend that he would be a key part of the Lakers and that unless the team was acquiring one of the league’s best three players, it wasn’t trading him. Pelinka delivered a similar message to Larry Nance Jr. prior to the deadline last season. 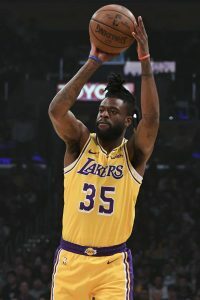 According to Oram’s source, Pelinka reassured Nance of the team’s plan for him and told the big man to buy the house he was pursuing in Los Angeles — Nance luckily was unable to complete all the necessary steps to buying the home before the team traded him to Cleveland. Some within Walton’s circle felt that agent Rich Paul was attempting to use the Anthony Davis saga to get the team to fire Walton. If the team acquired Davis, the franchise would need a more decorated coach. However, the Lakers heard through back channels that Davis liked Walton and that bought the coach more time. Members of the Lakers’ coaching staff had hoped that management would bring back the Julius Randle–Brook Lopez pairing last offseason. The team allowed both to walk in free agency. Sources tell Oram that Walton and his staff were not consulted about potential free agent targets last year until late in the process. Oram writes that Johnson is seen as an “absentee executive,” as evidenced by Johnson’s lack of response when LaVar Ball made allegations that Walton was losing control of the locker room last season. Johnson was in Hawaii at the time and didn’t publicly back his coach. Pelinka has been active in his involvement with the Lakers. He’s hands-on with scouting and coaches’ meetings, though his level of micromanagement has drawn criticism. Johnson caught the attention of James for his comments during an interview with SiriusXM NBA Radio. Johnson said the team needed to get the ball out of James’ hands because otherwise, the situation would be “Cleveland all over again and we don’t want that.” LBJ publicly said he wasn’t sure what Johnson meant. Last month, we outlined how the Anthony Davis saga in New Orleans could significantly impact what Karl-Anthony Towns next contract looks like. 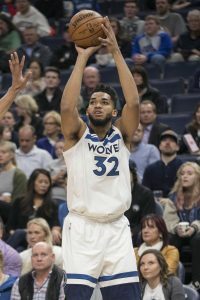 Towns’ new extension, signed last fall, will start at 30% of the cap if he earns All-NBA honors in 2019, as opposed to 25% of the cap if he misses out on an All-NBA slot. With Nikola Jokic and Joel Embiid expected to claim two All-NBA center spots, Towns is in position to grab the third, in part due to Davis’ trade request — not only will AD’s role in the Pelicans’ dysfunction be considered, but he’s playing limited minutes down the stretch while Towns puts up some of the best numbers of his career. Assuming Towns does earn an All-NBA nod, it’ll be a $30MM+ decision by award voters, bumping the projected value of his five-year deal from about $158MM to nearly $190MM. However, KAT isn’t the only player who could have his contract situation significantly impacted by this year’s All-NBA selections. While there’s some debate over which six guards will get All-NBA nods, Lillard looks like a slam dunk for a spot on the first or second team — Lillard, Stephen Curry and James Harden appear to be the strongest candidates for the two guard spots on that first team. Assuming he does, in fact, earn All-NBA honors, Lillard will become eligible for a Designated Veteran Extension. His current contract runs through 2020/21, with no options, so he’d be eligible to tack on four extra years to that deal, starting in 2021/22. For now, i’s impossible to say exactly what the NBA’s salary cap will be in 2021/22, but based on projections for ’19/20 ($109MM) and ’20/21 ($118MM), we can safely assume a max deal for Lillard starting in ’21/22 will be worth a lot more than it would be now. Conservatively, estimating a $120MM cap, Lillard’s super-max extension would start at $42MM and would be worth $188MM+ over four years. With Lillard in position to gain eligibility for a super-max extension, the big question in Portland this summer could be whether the Trail Blazers will actually put that offer on the table. There have been no indications that either Lillard or the Blazers wants to end their union, but the club might be wary of offering such a massive deal to a player who will be 31 years old when the four-year deal begins — that decision hasn’t worked out well for the Wizards with John Wall. As for Antetokounmpo, he’s on track to become eligible for a Designated Veteran Extension too, and that decision figures to be a much easier one for the Bucks. However, Milwaukee won’t be able to actually put that super-max offer on the table until the 2020 offseason, once Giannis has seven years of NBA experience under his belt. As noted above, Lillard, Curry, and Harden appear to be locks to earn three of the All-NBA guard spots. Kyrie Irving and Russell Westbrook are probably pretty good bets too. That would leave one spot up for grabs, with the three players listed above among the primary contenders, joined by Ben Simmons, Jrue Holiday, and one or two others. Walker and Thompson will both be unrestricted free agents this summer, and if they don’t earn an All-NBA spot, they’ll be eligible to re-sign with their current teams for up to about $189.7MM over five years. An All-NBA nod would increase their potential max salaries to approximately $221.3MM over five years, which could make their free agencies very intriguing. In Walker’s case, would the Hornets actually want to go that high for a point guard who will be 29 years old and had never made an All-NBA team before this year? If Charlotte didn’t put a super-max offer on the table, would Kemba be offended and explore outside opportunities, even if those rival suitors couldn’t offer as much as the Hornets? It would add a fascinating wrinkle to what already should be an interesting free agency. As for Thompson, previous reports have suggested he’s more interested in staying with the Warriors long term than necessarily maxing out his potential earnings, so it seems unlikely he’d push for a super-max deal if he became eligible. If he were to sign one, Golden State would have two players on Designated Veteran Contracts (Thompson and Curry), and wouldn’t be eligible to sign a third super-max contract until one of those deals expires. Fortunately for the Warriors, a max deal for Kevin Durant wouldn’t qualify as a third Designated Veteran deal, since Durant has 10+ years of experience, which automatically qualifies him for the 35% max. If the season ended today though, I expect Walker and Thompson would be shut out of the All-NBA third team in favor of Beal, who has had his best season as a pro, thriving without Wall in the Wizards‘ lineup. Assuming Beal earns All-NBA honors, he’d be eligible for the same super-max extension as Lillard — a four-year, 35% max deal that starts in 2021/22. 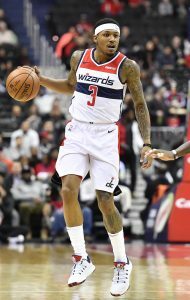 An All-NBA spot for Beal would leave the Wizards facing a very tough decision, as Fred Katz of The Athletic writes. Beal and his reps could rightfully argue that he deserves a super-max deal just as much as Wall. But if Washington puts that offer on the table, it would mean committing a ton of long-term money to a backcourt duo that has yet to lead the franchise to a deep postseason run. The safe play for the Wizards, with two years still remaining on Beal’s contract, would be to either table extension talks for now or to offer a slightly less lucrative long-term deal. But if the club doesn’t offer the full max, how would Beal react? As recently as November, he was involved in a heated practice altercation in which he yelled at general manager Ernie Grunfeld. If he feels slighted by a lack of a super-max offer, there’s no guarantee that Beal wouldn’t start looking for a way out of D.C.
Vucevic has had a terrific year in Orlando and deserves All-NBA consideration, but it’s hard to imagine at this point that he’d earn a center spot over Embiid, Jokic, or Towns, let alone Defensive Player of the Year candidate Rudy Gobert. Perhaps there’s a scenario in which he leads the Magic on a long winning streak in the season’s final three weeks, posting monster numbers and leading the club to a playoff spot. Even then, an All-NBA spot looks like a long shot — and even if he earned All-NBA honors, making himself super-max eligible, it’s very unlikely that Orlando would put that sort of offer on the table. Vucevic isn’t even a lock to be part of the club’s long-term frontcourt, with Mohamed Bamba, Jonathan Isaac, and Aaron Gordon all in the mix. Vucevic is worth mentioning due to the great season he’s had and the fact that he technically could become super-max eligible, but this situation isn’t nearly intriguing as the ones in Portland, Washington, or Charlotte might be. The MRI conducted Sunday on Klay Thompson‘s injured right knee came back clean, reports Shams Charania of The Athletic (Twitter links). According to Charania, the Warriors sharpshooter is expected to be considered day-to-day going forward, and his return will hinge on how quickly he regains a full range of motion in that knee. Addressing his knee issue over the weekend, Thompson said he didn’t think the injury – suffered on Thursday vs. Orlando – was anything serious, adding that he considered the MRI a precaution. It appears the results of the test confirmed that view, though the Warriors will likely still be cautious with Thompson’s return, since they want him fully healthy for the postseason. Alfonzo McKinnie, who started in Thompson’s place on Saturday, left that game with a hip injury. If both Thompson and McKinnie remain sidelined for Tuesday’s showdown vs. the Celtics, Damion Lee could be in line for a start and an increased role — he played 26 minutes off the bench in Saturday’s win over Philadelphia. After Tuesday, the Warriors don’t play again until Friday night, when they’ll host the Nuggets. The Warriors have an open roster spot, but they won’t use that opening to add another wing, as Andrew Bogut is reportedly set to rejoin the club. Warriors shooting guard Klay Thompson will miss Saturday’s game against the Sixers due to right knee soreness and is scheduled to have an MRI on that knee on Sunday, as Nick Friedell of ESPN.com relays. While Thompson will undergo an MRI to assess the injury, which he suffered during Thursday’s game against Orlando, he views the test as a precaution and doesn’t believe the issue will sideline him for an extended period. Although Thompson’s injury doesn’t sound significant, it’s worth monitoring any health issue affecting one of the Warriors’ star players, since that may be the only thing that can derail them from claiming their third consecutive championship. If the Dubs do have to hold Thompson out of action for longer than anticipated, they have an open roster spot and could add some extra depth if it’s needed. Thompson has only missed one other game this season — that contest, which took place on January 31, when Klay was battling an illness, was also against Philadelphia. Giannis Antetokounmpo could be the next superstar prize on the Warriors’ radar screen. In a speculative piece, Marcus Thompson II of The Athletic dives into the possibility of Antetokounmpo joining Golden State when he becomes a free agent in 2021. As Thompson outlines, pursuing Antetokounmpo would hinge on Kevin Durant departing and would also necessitate cutting ties with Draymond Green. That would give the Warriors enough cap room to sign Giannis and keep the backcourt of Stephen Curry and Klay Thompson together. The possibility of Antetokounmpo wanting to leave Milwaukee could increase if the Bucks experience postseason disappointment, Thompson adds. The Warriors are committed to keeping their championship core together even if it leads to unprecedented financial implications. Owner Joe Lacob recently declared that the Dubs “can do whatever [they] want” in terms of finances and that cost concerns won’t be the reason the team doesn’t “stay great” going forward. Klay Thompson, who will be a free agent at the season, is encouraged by Golden State’s stance and the commitment to remaining a championship contender. “That’s good to hear, I know Joe’s competitive. He wants to win more than anything. And he will put together the best team to do that. Hopefully, I’ll be a part of it,” Thompson said (via Mark Medina of The Mercury News). Klay Thompson once again reaffirmed his desire to finish his career with the Warriors prior to the team’s game against Portland on Wednesday, according to ESPN’s Dave Pasch (Twitter link). This isn’t the first time Thompson has publicly stated these hopes, with the All-Star guard also discussing the possibility back in September before the 2018/19 season began. “Just look around the walls at all the art and to see I was a part of this buildup is what keeps me motivated and keeps me wanting to be a Warrior for my whole career,” Thompson said at the time, as relayed by Monte Poole of NBC Sports Bay Area. Thompson has spent each of his eight seasons with the Warriors, having being drafted by the team back in 2011. He’s set to become an unrestricted free agent on July 1, along with with teammates Kevin Durant and DeMarcus Cousins, both of whom have yet to make similar public declarations about their summer plans. Of the Warriors’ starting five, only Stephen Curry and Draymond Green are locked into deals past this season (with Green set to reach free agency next summer). Golden State has grown tremendously with Curry, Green and Thompson, dating back to when the trio won their first championship in 2015. The Clippers knew exactly what they were getting when they traded for Ivica Zubac, Mirjam Swanson of the Orange County Register writes. The team acquired Zubac, an improved center on both ends of the floor, in a deal with the Lakers on trade deadline day. Warriors head coach Steve Kerr was fined $25K for verbally abusing and confronting a game official prior to his ejection on Wednesday, the NBA announced today. Kerr was arguing a flagrant foul call on Draymond Green with veteran referee Ken Mauer before losing his temper, causing Mauer to issue two technical fouls and remove him from the game. LeBron James and Giannis Antetokounmpo drafted their teams for the 2019 All-Star Game on Thursday, officially finalizing the rosters for this year’s contest. James and Antetokounmpo were chosen as captains because they were the All-Star starter from each conference with the most fan votes. Both James and Antetokounmpo first had to select from a pool of starters, then from a list of reserve players. The starters, which consisted of eight other players, were voted on by the fans, players and media this season. The reserve players were voted on by the NBA’s 30 head coaches. James drafted Kevin Durant, Kyrie Irving, Kawhi Leonard and James Harden as starters, choosing Durant as his first selection. His reserves were Anthony Davis, Klay Thompson, Damian Lillard, Russell Westbrook, LaMarcus Aldridge, Karl-Anthony Towns, Bradley Beal and Dwyane Wade. Antetokounmpo drafted Stephen Curry, Joel Embiid, Paul George and Kemba Walker as his starters, selecting Curry with his first pick. He drafted Khris Middleton, Nikola Jokic, Ben Simmons, Blake Griffin, D’Angelo Russell, Nikola Vucevic, Kyle Lowry and Dirk Nowitzki as his reserves. James later traded Westbrook to Team Giannis in exchange for Simmons, making an effort to repair the relationship of Westbrook and Embiid. The 68th NBA All-Star Game is set to commence on February 17 at Spectrum Center, featuring 26 of the best basketball players in the world. Re-signing pending free agents Kevin Durant and Klay Thompson to substantial, long-term contracts would have major financial implications for the Warriors – upward of $300MM per year, potentially – but franchise owner Joe Lacob doesn’t think luxury tax and salary costs are the issue heading forward, Tim Kawakami of The Athletic writes. Kawakami notes that this is a change in tone from what we’ve heard from the team’s ownership group in the past. There may be several factors responsible for that, including the “unprecedented influx of cash” that the team’s new stadium is expected to bring. The Warriors will begin playing at the Chase Center next fall. The Warriors are in somewhat of a holding pattern until Durant makes his decision whether to remain with the franchise or move elsewhere, Kawakami notes in the above-mentioned article. These dynamics may have put Anthony Davis just out of reach for the team. “The best thing for us to do is keep our great players together as long as we can, as long as we should, and then develop on the margins,” Lacob said. With free agency looming and the Knicks posturing to be a major player, New York appears to at the very least be an option for Durant. Kevin O’Connor of The Ringers writes that the forward has wavered between staying or leaving all season. Since the blockbuster trade that freed up two max contract slots in the Knicks’ books last Thursday, Durant has been quieter than usual, Mark Medina of The Mercury News writes. Durant has avoided post-game interviews after each of Golden State’s last two matchups.